Learning the months of the year in Māori! Yummm! Jealous of what you got to do in this lesson Naomi. What a cool review of the chocolate you tasted. I like the wrapper design also! Magnificent, fabulous and amazing, all the words to explain how much I loved that chocolate. 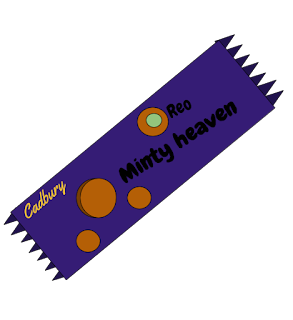 This chocolate is a chocolate with a minty surprise in the middle. It cost $3.99 for a whole block but I just had 2 pieces. It has mint and oreo bits in the middle and covering it is milk chocolate. His chocolate smelt amazing. It also felt smooth but the edges were kind of crazy. It looked nice to eat and when I went in to take a bite it was melting in my mouth( not really but you get the Idea). All I could taste was the mint it wasn't bad I liked it a lot. I loved it and I really wanted more. If I could taste all of the flavors then That would be cool. It was nice but If you could taste the chocolate with the mint that would be amazing. The oreos I could not taste but I could only taste it a little bit it tasted like cookies. I liked it but is was not my favorite. I really recommend this chocolate but if you do not like mint then you can get the same chocolate but in different flavors. The flavors are strawberry, original and mint ( the one that I ate). Task description: This task was to talk of a food critic's perspective. The food critic is homer on the Simpsons. Were taste testing chocolate and the wrappers were off so we didn't know what it was.